With the Sith box shipping any day now, Funko has set it’s sights on it’s next box theme: Endor. This opens up a wide range of possibilities of what we might see, but it seems to fit with the Chewbacca riding in an AT-ST Pop Ride that was unveiled last week and set to arrive around March-April. It’s hard to speculate what we might get to see in this latest box. The first thing that comes to my mind is another Ewok, but that almost seems too obvious. 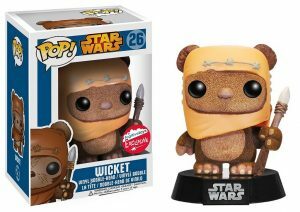 We already have a Wicket, a Fugitive Toys Exclusive Flocked Wicket, and the Walmart exclusive Ewok 3-pack that came out last fall. Have any ideas of what we’ll see in this box? Make your opinions heard and sound off below! i hope it is not an ewok. i really like when they do deluxe versions in the boxes. they did a speeder bike luke and leia…..a trooper speeder bike would be kinda cool but i just wish they would come up with something clever.